Bored with the randy city? Sick spend all holidays go around the mall and the city? Why don’t you try to feel the mountainous atmosphere? Inhale the mountain air makes your body and joints more fit, well, and peaceful. You can come to Brastagi. Brastagi was located at the south slope of Mountain Sibayak. Administratively, Brastagi located at Tanah Karo regency with its capital city Kaban Jahe, 78 Km from Medan (capital city of North Sumatra). The green feel from the leaves at the slope of mountain Rangkap Sibayak makes Brastagi feel more cool and chilly, and many tourists love it. Not only the mountain, the hill and the farms make your eyes ‘green-green’. Brastagi is very potent for its agroindustry, and become the perfect place to traveling around Toba lake and Samosir island (trade mark of North Sumatra). Brastagi position is very strategic as transit place. Many tourist objects reach easily and many hotels available. The rate for the Hotels is variable and offers unique local design. You can choose hotel or villa which historically those places were archaeological remains at the colonial area. The distance between Bratagi and Sibayak mountain is only 7 Km. This position makes many mountaineers choose this city as the nearest alternative to go up to the top of the mountain with 2.094 meters height. With suitable infrastructure you can utilize vehicle to get closer to the mountain. At the top of the Sibayak mountain, you can see a lake from crater. Its wide is 200 x 200 meters , with active sulfur production, 119.60celsius. The temperature air around the lake was 210celsius. 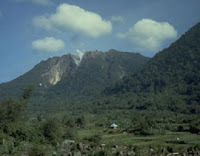 You also can see the top of the Sinabung mountain which has 2,451 meter height. 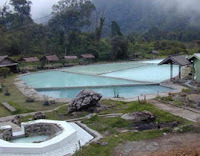 Not only that, not far from Brastagi, to the top of Sibayak you can see lokasi Lau Debuk-Debuk (Hot water source tourists). It was located at Daulu village. This hot water temperature is 350celsius, appear from the crack of lava flow at the slope of the mountain. Many mountaineers take a break for a while in here. At the upper course of the sources which temperature is up to 1500C, you can see power plant. Visitors can see the nature process of fume power plant. It produce energy which is pollutant free and no radioactive effect. Brastagi also has hill and mountain range tour, known as Bukit Gundaling (Gubdaling hill) 3 Km from Brastagi. To reach the hill, you can walk or rent sado. Sado is a kind of wheel transportation using horse. This hill offer the beauty of its park and suitable for relaxing or jogging. At the peak of the hill, you can see the scenery of Sibayak volcano and Sinabung volcano with their amazing volcanic activity. Mean while, tourist object Tongging also offers scenery in Brastagi. It was located at the south about 35 km from Brastagi, at the side of Lake Toba. Here, you can see the beauty blue of Toba Lake and the mountain range at Samosir island clearly. This special scenery was completed by the peak of mountain Sipiso-piso and Tongging waterfall. Kampung Lingga is not just natural tour of Brastagi, but also a culture tour which become the mainstay of this city. 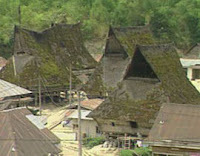 There is kampung Karo culture tour about 16 km to the south of Brastagi, at kampung Lingga (Lingga village). This was a place that offers Batak Karo ethnic legacy. You can see Batak traditional dance called Batak Karo and Batak Karo traditional house. It was estimated has been 250 years old, with its special and unique shape, different with other traditional house. Traditional buildings such as custom house, jambur (place for meeting), geriten (place to keep corpse), lesung, can be seen in here, complete with its culture. All of this makes Brastagi become more intact, all at once as culture tour.